Galaxy S5 is latest flagship model from Samsung Mobile and packed with some awesome features and spec. Private mode is one of them, with the help of this feature you can hide and lock all you personal file like image, videos, files etc without installing third party application on your S5. 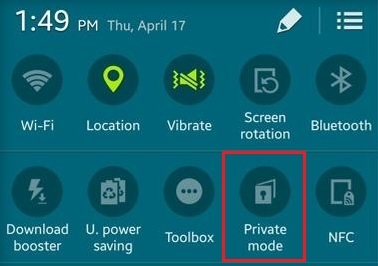 The Galaxy S5 Private Mode is a built-in feature of the newly released device and one of the best way to protect all your files. In our previous post we hares lot of article to hide the files in android device and how to lock them on the android. Today in this tutorial we show you how S5 users can do the same without installing any application. It’s pretty simple, but you do need to follow a few steps. 1. Enable Private Mode on S5. To enable this feature swipe down the status bar with two fingers and here you will see some quick settings option, which includes Private mode. Tap on it to enable it on your S5, and select the unlock method you can use the pattern lock or the new Fingerprint scanner. 2. 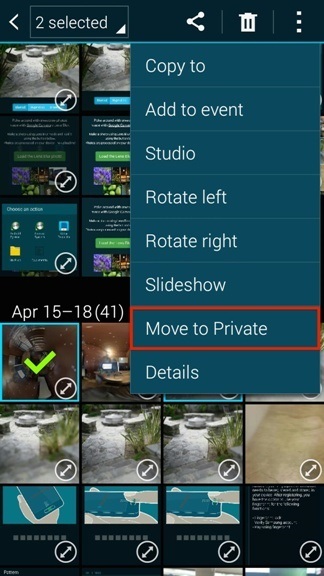 Hide Picture and Video Form Gallery Once the feature in enable on the device, go to the galley and select all the images and video file which you wanna hide on your S5. Now tap the three dot menu button form the top right and and select Move to Private. Now all the files are move the private folder and to hide go back to the Status bar and turn off Private mode. This will make all of your files seemingly disappear from your device. 3. How to See Hidden or Private Files. To access all you private files you have to ust enable the Private mode and unlock the patter or password. Now you will see all the hidden file son your S5. Once of the best feature in Galaxy S5 model to hide al the personal and important files form your friend or family members.